Bioradicante - Kenya Biologics Ltd.
Plants need to develop strong and healthy root systems for adequate foliar growth and to achieve optimum yields during harvest. The application of free L-amino acids increases protein synthesis (essential in the first stages of growth), which directly or indirectly influences the plant’s physiological processes. Among many functions, amino acids improve chlorophyll and auxin synthesis, germination, flowering and pollination while also enhancing the quality and ripening of fruits and stoma opening. Amino acids also act as natural chelating agents for the micronutrients, increasing the nutritional state of the crop. 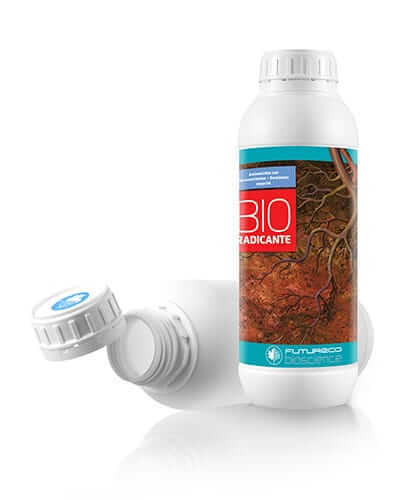 Use BIORADICANTE dissolved in irrigation water at transplantation, during vegetative growth and to recover root damages caused by nematodes, fungi or agricultural devices. Bioradicante can also be used in hydroponic systems. BIORADICANTE is stable for at least three years since manufacturing date. Store in the closed original container in a cool, well ventilated area. DO NOT store for prolonged periods in direct sunlight. Keep away from food, drink and animal feedingstuffs. Keep out of the reach of children. BIORADICANTE is highly compatible with most pesticides and fertilizers. For application with plant protection products follow pesticide label directions and make jar test for compatibility. *Free L-amino acids are obtained from an enzymatic hydrolysis of vegetable proteins. Tomato, pepper, cucumber, melon, zucchini, etc. 2-3 L/Ha 3-4 Apply during transplantation and repeat at 15 days. Lettuce, cauliflower 3-4 L/Ha 2 Apply during transplantation and repeat at 20 days. Pome and stone fruits 10-15 cc/ Tree 3 Apply after the first shoots and repeat at 15 days. Banana tree 5 L/Ha 3 Distribute applications throughout crop cycle.